As can be observed in these commentaries on the titles of the Litany of Loreto, Cardinal Newman had a deep and tender devotion to the Mother of God. For the close of the month of May he comments on the title Morning Star. 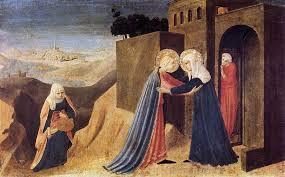 He notes that Mary is called by two names that convey her beauty: Mystical Rose and Morning Star. But the later suits her best because a rose belongs to the earth and has a short life. A star, instead, is high in heaven and abides forever. Holy Mary, Morning Star, you always lead us to your Son, the Father and the Holy Spirit. Be always close to us, guiding us to the Blessed Trinity. Lastly, it is Mary’s prerogative to be the Morning Star, which heralds in the sun. She does not shine for herself, or from herself, but she is the reflection of her and our Redeemer, and she glorifies Him. When she appears in the darkness, we know that He is close at hand. He is Alpha and Omega, the First and the Last, the Beginning and the End. Behold He comes quickly, and His reward is with Him, to render to everyone according to his works. “Surely I come quickly. Amen. Come, Lord Jesus. Thank you for this beautiful reflection, Fr. Juan.